“Life too short to eat boring rice” says the advertisement for Arborio Rice in the latest magazine issue of La Cucina Italiana. Naturally, I couldn’t agree more. I was thumbing through the issue that had just arrived in the mailbox while indulging in my afternoon espresso, made complete with an almond biscotti. There are always wonderful and easy recipes to enjoy in this magazine and I almost always select one to try before the week is out. 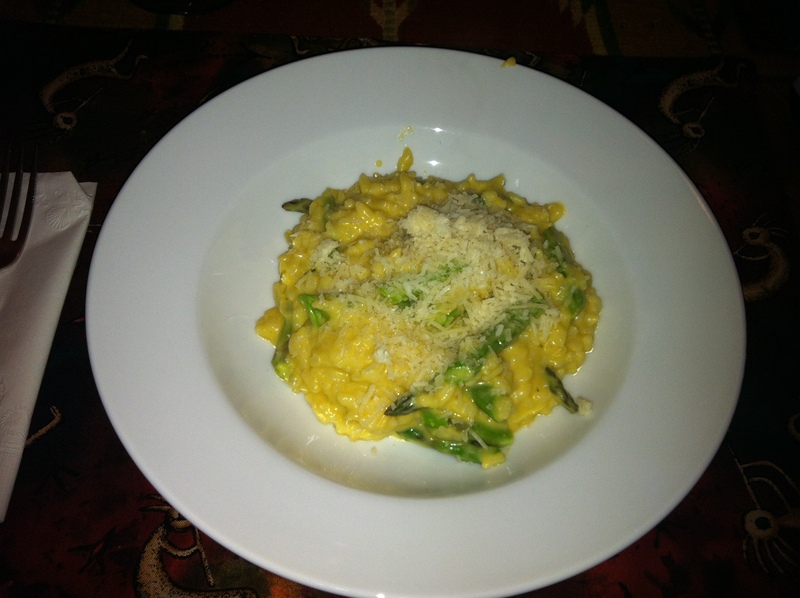 When I saw the Arborio rice advertisement I noted a recipe for Asparagus Risotto. Hmm….I say to myself as I check out the list of ingredients. I have them all….even, as luck would have it, a bunch of asparagus I’d just picked up at the grocery store. Yes…they do have asparagus in “middle earth.” I know. I just couldn’t resist that cynical barb. As I began preparing the risotto recipe for dinner, it occurred to me how odd that I was using the recipe from an advertisement in the magazine instead of selecting one of the myriad of wonderful recipes featured in the issue. I could have, for example, selected the recipe Torta di Riso allo zafferano (saffron rice cake). Nope. No Sambuca on hand. Oh dear…I stop for a moment; will I even be able to find Sambuca in “middle earth?” I suppose I’ll cross that bridge when I come to it. Onwards. 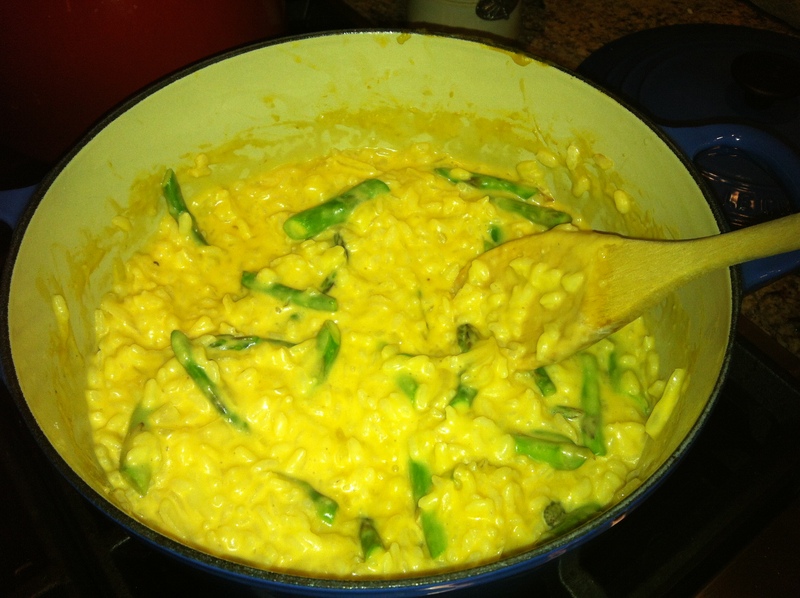 Yes…there were a couple of Arborio rice recipes featured in the March/April issue. In fact, I will absolutely try my hand at the Risotto alla Erbette con Polpettine di Pollo recipe (Swiss chard risotto with chicken meatballs)! The photo alone of the dish had me salivating… maybe for Easter weekend? But this time, I opted for what I had on hand, too lazy to get into the car and venture out again in the cold and lazy as well to try something more laborious. I selected a classical music track on Spotify and started stirring away, a ladle of vegetable broth at a time. One ladle at a time…. By the time hubby walked in the door limp with fatigue after a long work day, I had the risotto dish ready for our evening meal. A delightful crisp white wine, a mixed green salad, and this wonderful risotto recipe from what may as well have been from the back of the box. And though it took a bit more time, why on earth would anyone want to prepare a boxed rice dish? I cringe at all those Rice-a-Roni meals I fed my kids when they were little. They didn’t need chemicals one cannot even pronounce when I could have spent a extra minutes more to prepare a variety of mouth-watering, wholesome, real rice dishes. Ay! Could this be why they ….Oh, never mind…lets not go there! HA. Anyhow, I must say, I couldn’t stop patting myself on the back. It came out absolutely perfect; the right balance of creaminess and tenderness. I don’t often get that lucky. Risotto is not the kind of dish one can make in advance, say for a dinner party and one has to pretty much stand over it for the better part of 25 minutes. I surprised myself and did not go back for seconds! My hubby was happier than a pig in alfalfa which pleased me to no end. What could be more blissful on this cold evening?! My Italian family, both on earth and in heaven, would be so proud! I’m including the recipe….for my two followers! Heat water and vegetable broth in a 2-quart saucepan over medium heat until it comes to a simmer. Reduce heat to low and keep warm. Meanwhile, melt 2 tablespoons of butter in a large saucepan over medium heat; add the asparagus and cook until tender crisp. Remove asparagus; set aside. In the same saucepan, cook the onions in the remaining 1 tablespoon of butter or olive oil until soft. Add the rice and stir 2 to 3 minutes. Add the white wine; stir until absorbed. 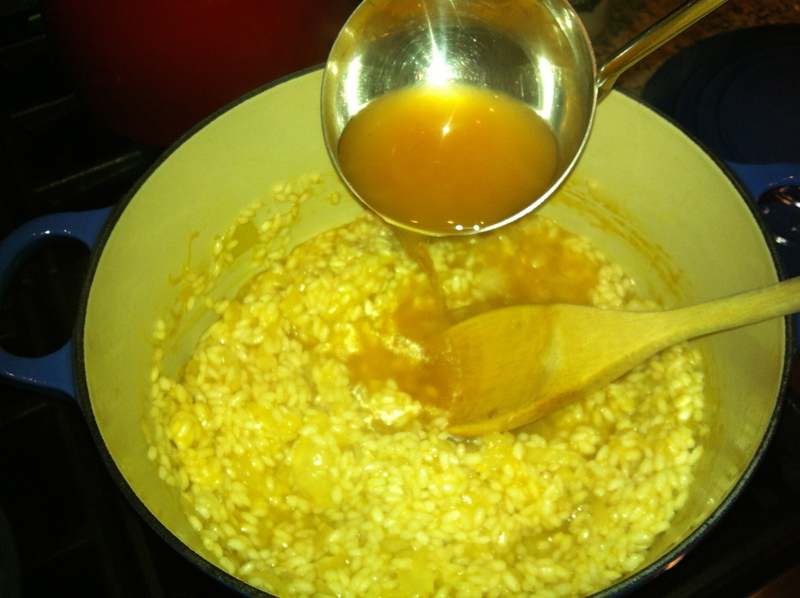 Increase heat to medium-high and stir in 1 cup (I used a soup ladle) of the water-broth mixture. Cook uncovered, stirring frequently, until liquid is absorbed. Continue stirring and added the remaining water-broth mixture 1 cup at a time, allowing each cup to be absorbed before adding another. Cook until the rice is tender and the mixture has a creamy consistency, approximately 25 to 30 minutes. 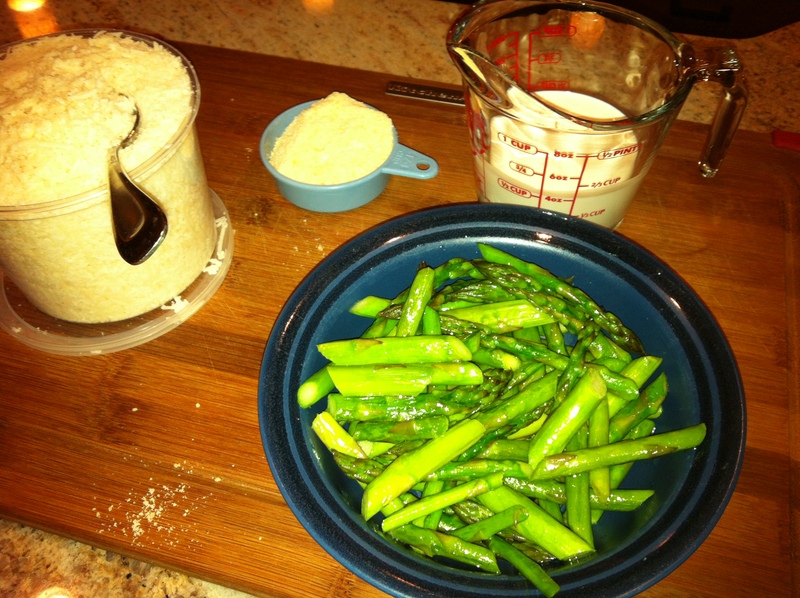 Stir in the asparagus, cream, cheese, salt and pepper. Stir until the mixture is creamy, about 2 to 3 minutes. Serve immediately with additional Parmesan cheese to taste. Serves: 8….but for this Italian woman and her man, more like 4! HA!